"Friends for Fun, Safety and Knowledge"
Wing Ding 33 will be held in Knoxville, Tennesee! Call 800-843-9460 or 623-581-2500 (Phoenix) to make your reservations now! Husband: What have you been doing with all the grocery money I have been giving you? Wife: Turn sideways and look in the mirror! GWRRA is now on Facebook! Check out GWRRA's new Facebook page and sign up to follow us! It is easy!! and Officer profiles, your stories about how joining GWRRA has positively affected your life, etc. Please send your stories to me here. 2-What year did Knoxville host the World's Fair and how many people attended? 746 rooms have already been sold! So far, pre-registrations are running ahead of last year's Wing Ding in Des Moines! 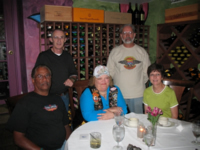 The 2nd Annual Forty to Phoenix is scheduled to begin Friday, March 11th, 2011 from Wrightville Beach, North Carolina at 7:00 a.m. You can join the ride anywhere along the way! Mark your calendars to join everyone for this cross-country trip to see GWRRA's Home Office in Arizona! The trip will cover four (4) regions and twelve (12) states! The Home Office is planning some special events, so check out GWRRA's Facebook page or contact Brian McCallum for more information. It is time to update your Gold Book listing. Remember to make sure you have a current phone number listed on your Member listing, as well as the correct listing you wish to show in the Gold Book. (i.e., tools, phone calls, etc.) Also, remember if you select "Do not list me in the Gold Book" as one of your selections, you will NOT show up in the Gold Book! There seems to be a bit of confusion with the new Message Boards, so hopefully this information will be helpful. Once you are in the Message Boards, if this is your first time, you need to go up to the right-hand corner and press "REGISTER". There you will fill out the information asked and create your own user name and password. Keep in mind the user name you choose can't be changed and it is what everyone will see on the Boards when you are logged in, so choose carefully. If you still have any questions on this process, please give us a call. It is easier to walk you through it over the phone 800-843-9460.
date we have 1,519 pledge forms signed. to sign up to help get pledges at your events. The more events that have the pledges for our Members and guests to sign, the faster we can reach our goal and maybe be on Oprah representing GWRRA! Help us get more pledges signed by taking pledges to your community events and having all your non-motorcycling friends sign up now! on regular tour package prices. It is hard to believe by the time you receive this edition of Wingin' It, it will almost be Labor Day...where did the summer go? I hope you had a great summer and got some awesome riding in. In this issue, you will notice we are very fortunate to have several articles from our friends in the Rider Education field. One of the articles is to keep us informed on the latest motorcycle accident statistics and the other is an article about "lightning." Thanks Gene and Don! We also have another great Gold Book story, Chapter activity that is unusual and several poems, which is a nice contrast to those "heavy" Rider Ed subjects. Other news--In the middle of August, Mike Stiger was here to visit and learn all about the systems we have in place to take care of you, our Members, plus to chat with each of our department heads and get a feel for how we run our departments. Mike was able to sit in on our staff meeting and brief everyone on how he would like to "steer" GWRRA. There is a lot of buzz over Wing Ding 33 in Knoxville, so we have a new column on the latest updates there. We have also confirmed that "Forty-to-Phoenix" will hold its second annual run starting Friday, March 11, 2011 from Wrightville Beach, North Carolina. See below for more information. We would like to say "THANKS" to the 1,927 Officers who have taken the Officers Certification Program (OCP), since it was announced in February. For our advertisers, we have lowered our prices to run an ad in this e-Newsletter. Please contact me to get the new rates and have an information sheet sent to you. In response to the last e-Newsletter, I heard from many Members who are very happy with the new Member Discount Programs GWRRA has presented. I also heard from a Canadian Member who did not like that they were not available in Canada, but understood and is trying to help us find companies who want to help us offer our Canadian Members benefits. And the same happened with our German District Director. Thank you gentlemen! That is what GWRRA is all about and how GWRRA started getting benefits for its Members...Members helping Members! So, let me know if you live outside the United States and may know of a company who wants to offer our Members benefits in your country. Keep your articles, jokes, travelogs and stories coming...and thanks to those who send me your contributions! Another Great Gold Book Story! We left with Phil and Mary Lou Johnston for Des Moines, Iowa and Wing Ding early in the morning. We stopped in Amarillo for breakfast and headed for Emporia, Kansas to spend the night. About 4:30 P.M., we were 20 miles south of Wichita, Kansas on I-35, when my rear tire on the bike let loose. We pulled over and Phil got out the Gold Book, and I started calling. Victor Bowen was the first number I dialed and got a recording. I left a message stating my problem and what I needed. I moved on to the next number. That individual didn't have the means to help me as I was towing a trailer. Then, a call came in. It was Vic. I explained my problem and he said he had a trailer, but it wouldn't hold my trailer and to give him a few minutes and he would see what he could do. A few minutes later, he called back and said a buddy of his (a Harley rider) could bring his truck and tow my trailer. To make a long story short, Vic arrived along with John VanVranken. Vic loaded my bike into his trailer and John hooked to my trailer, and off we went to Wichita with Phil and Mary Lou following on their trike. Vic took us to his home and dropped off the trailer for safekeeping and took us to a motel nearby, then to supper. The next morning, they picked us up, and we dropped off the bike at the Honda dealer for a new tire. After breakfast with John, Vic and Phil, we picked up the bike from the dealer, swung by the motel to pick up our spouses and we were back on our way to Wing Ding. Vic had planned to leave at 5:00 A.M. that morning for Wing Ding. Instead he took the time to help us. About a year earlier, he had lost a lung to cancer and his lovely wife, Enrica, was worried about him traveling by himself. He accepted our offer to ride with us to Wing Ding, offering to show us a couple of shortcuts along the way. He had supper with us each night while we were in Des Moines. We had met a true friend due to my hard luck and the Gold Book. Vic apologized that he didn't answer the phone when I first called. It was his home phone, and they were out to dinner when I called. He said he was going to change the number in the Gold Book to his cell phone so that wouldn't happen again. Here is a guy that knew I had a serious problem, still returned my call and changed his schedule to help someone he didn't know. This is what GWRRA is all about. Thanks to my misfortune, I have a new friend. Thanks Vic for all you do! But you'll never accomplish more. For failure comes from the inside first. It's there if we only knew it. You can do whatever you think you can. When I joined GWRRA the one thing that got me interested was the fact that they stated they were a "community- minded organization". A place hubby could ride his new (to him) Wing and something near and dear to my heart .... community service. This past year JC and I have been assistant Chapter Directors of Chapter Q Clarksville, Tennessee, and we have had the opportunity to make some connections with surrounding communities and get out the motorcycle safety and awareness information. The latest chance we had to do this was in a town just north of us called Hopkinsville, Kentucky. I was able to make contact with Gary McIntyre of the Parks and Recreation Department. We went up and pitched our idea, and he was happy to get involved. Gary set up a television interview, as well as radio ads to advertise our GWRRA Chapter Q Motorcycle Safety and Awareness Festival. I was also able to make contact with the Hopkinsville Fire Department, and they sent an inspector out to give a class on motorcycle safety and fire. We learned that we need to slightly tip back and forth our extinguishers every now and again, or they will cake on the bottom and not work. BOY, were we surprised to see all of ours had settled just as she had said they would. We were also able to contact the Hopkinsville Police Department who was on hand to give out children safety kits. He was there to answer questions. We also learned about Kentucky's helmet law. Many think as soon as they ride over the border that they can remove their helmets, imagine our surprise when we learned not so fast! You have to hold a Kentucky state motorcycle license for at least a year before you can do that! Air Evac was able to fly in their emergency evacuation helicopter, and we learned about emergency extractions. It was neat to see how much equipment is in such a small confined place. We also learned they can transport someone who is up to 400 pounds and over 6 feet tall. This may sound like nothing until you see that small area they have to squeeze you into! We enjoyed vendors, awesome BBQ and fun times! Take a look at the statistics below if you think riding without a motorcycle helmet is a good way to save money. With the number of U.S. motorcyclist deaths jumping 78% to 5,154 in 2007 from 2,897 in 2000, a recent University of Southern California study points to the wearing of a helmet as the major factor in surviving a motorcycle crash. Below are additional statistics that explain why motorcycle insurance premiums continue to rise. Although motorcycles represent only 3% of all registered vehicles in the United States, motorcyclists accounted for 13% of total traffic fatalities in 2007. Per registered vehicle, the fatality rate for both motorcycle operators and passengers is 5.5 times higher than that for passenger car occupants. Per vehicle mile traveled, motorcyclists are about 35 times more likely to die in a car crash than people traveling in passenger cars. During 2007, 50% of all fatal motorcycle crashes involved collisions with another type of motor vehicle in transport. Of these two-vehicle crashes, 78% of motorcycles involved were struck from the front. Only 5% were struck from the rear. In 25% of fatal motorcycle crashes, the motorcyclists crashed into a fixed object like a telephone pole or a concrete abutment. Speeding was a factor in 36% of fatal motorcycle crashes during 2007. This compares with 24% for passenger cars, 19% for light trucks and 8% for large trucks. Florida (530), California (495) and Texas (375) had the highest number of motorcycle fatalities in 2007. The NHTSA estimates that helmets saved 1,784 motorcyclists from death in 2007. If all motorcyclists had worn helmets, an additional 800 lives could have been saved. Helmets are considered to be 37% effective in preventing fatal injuries to motorcyclists. This means for every 100 motorcyclists killed in crashes while not wearing a helmet, 37 of them could have been saved had all 100 worn helmets. Sadly, use of motorcycle helmets in the U.S. has declined by 13 percentage points to 58% in 2007 from 71% in 2000. Remember, in an accident your head is usually one of the first parts of your body to feel the impact. Why chance it, wear a helmet and continue to see the sunrise tomorrow. I wrack my brain, but all in vain! A zero is my score. At times I put something away where it is safe, but, Gee! The person it is safest from is, generally, me! Then, when the person walks away I ask myself, 'who the heck was that? Lightning is the MOST UNDERRATED weather hazard. On average, only floods kill more people. Lightning is most often seen in thunderstorms. In fact, lightning is what makes thunderstorms. Lightning makes every single thunderstorm a potential killer. Forecasting when and where lightning will strike is not yet possible and most likely never will be. In the United States, lightning routinely kills more people each year than tornadoes or hurricanes. Only lightning can strike outside the storm itself, and is the first thunderstorm hazard to arrive and the last to leave and knows no boundaries. Since lightning is so unpredictable, no one can guarantee an individual or group absolute protection from lightning. However, knowing and following proven lightning safety guidelines can greatly reduce the risk of injury or death. While no place is 100% safe from lightning, some places are much safer than others. Buildings that are NOT SAFE (even if they are "grounded") have exposed openings. Convertible vehicles offer no safety from lightning, even if the top is "up". Other vehicles, which are NOT SAFE during lightning storms, are those which have open cabs, such as golf carts, tractors, and construction equipment. The safest location during a thunderstorm is inside a large enclosed structure with plumbing and electrical wiring. If lightning strikes the building, the plumbing and wiring will conduct the electricity better than a human body. If you are using any electrical appliances or plumbing fixtures (INCLUDING telephones and computers), and a storm is overhead, you are putting yourself at risk! If no buildings are available, then an enclosed metal vehicle such as an automobile, van, or school bus makes a decent alternative. If you are inside a vehicle, put the windows up, and avoid contact with any conducting paths leading to the outside of the vehicle. Lightning can strike as far as 10 miles from the area where it is raining, and many people are unaware of how far lightning can strike from its parent thunderstorm. If you can hear thunder, you are within striking distance. Seek safe shelter immediately. Remember this lightning safety rule...When thunder roars, go indoors and stay there until 30 minutes after the last clap of thunder. DON'T wait for the rain to start before seeking shelter, and don't leave shelter just because the rain has ended. There is NO SAFE PLACE outdoors during a lightning storm. If stuck outdoors on a highway, you could find a highway overpass and park the bike and get as high as possible from the road, high enough to be out of any water, on the embankment between the highway and the bottom of the bridge. At the same time, do not touch the metal of the bridge. You are trying to get away from metal and water conductors. Lightning can be as hot as 54,000�F (30,000�C), a temperature that is five times the surface of the sun! Water and metal are excellent conductors of electricity. The current from a lightning flash will easily travel for long distances. The average lightning bolt carries about 30,000 amps of charge and has 100 million volts of electric potential. These amounts can burn through ANY insulator (even the ceramic insulators on power lines!) Besides, the lightning bolt may just have traveled many miles through the atmosphere, which itself is a good insulator. GWRRA is excited to announce the addition of a great new product. The Custom Riding Jacket is now available to you at a fantastic price that can't be beat! Unlike anything we have ever offered before, this attractive jacket has embroidered crest logos on the upper sleeves and "GWRRA" on the left chest. Made of 600 Denier Oxford Shell fabric with PU coating, water repelling treatment and Teflon finish, this jacket is second to none. It also offers a removable inner liner, adjustable waist, sleeves and cuffs. It is constructed with a breathable water and wind resistant 2-layer membrane for your comfort and convenience and is 100% waterproof. Safety features include CE certified protectors on the (pre-curved) elbows, shoulders and back, and reflective piping for nightime visibility. Your price - $105.00! Similar jackets sell for well over $250 in the marketplace! Click here for more information or call 800-843-9460 or 623-581-2500 (Phoenix) to order! If these Discount Programs may be of interest to you, just click on the link or call 800-843-9460 or 623-581-2500 (in Phoenix) for more information. Get the GWRRA 10" Logo Crest Patch black/gold. Your vest or jacket will shine with this new patch. You can put this on the back of your vest/jacket and show your GWRRA pride. Click here or call 800-843-9460 or 623-581-2500 (Phoenix) to order. Click on above link to go to the GWRRA Official Products website and view the product on sale this month, and be sure you mention the special code on this coupon. 1-101 square miles and 526-square miles for Knox County. Offer Expires: 9/30/10. Mention code "September E-news"